In third pAsuram – mother says “My daughter (parAnkuSa nAyaki) desires for the thiruththuzhAy (thuLasi) from the divine feet of emperumAn who divinely measured the worlds”. Subsequently, mother says “My daughter calls out for the thiruththuzhAy from the divine feet of thrivikrama who is glorified by all worlds”. Third pAsuram. mother says “My daughter is saying – What is the impediment in getting that which is held by the one who helped the whole world instead of the one who helped just a town?”. kOdhai – flower garland like daughter, or daughter who is wearing a flower garland. emperumAn (measured the world and) stood to be worshipped by dhEvas and eminent sages like sanaka et al, who are having vEdha sUkthams which are existing in chandhas, with many divine garlands; I, a great sinner, have a daughter who is herself [tender like] a flower garland, and who is calling out only for the thiruththuzhAy which is desirable like reddish gold and is adorned on the reddish divine feet of such emperumAn. nal mAlai – with the best garlands among such vEdham – that is with SrI purusha sUktham etc. [Why specifically hymns from vEdham?] Though bhagavAn is glorified in other places too, since his nature and qualities are clearly revealed in vEdham, using [such vEdham which says] katavalli upanishath 1.2.15 “sarvE vEdhA yath padhamAmananthi” (the vEdhams which speak about the nature of paramAthmA who is the ultimate goal) and in Sri bhagavath gIthA 15.15 “vEdhaiScha sarvair ahamEva vEdhya:” (I am the object of knowledge in all vEdhams). Alternatively, reading vEdham and nanmAlai separately, it is explained as – with vEdham which speaks about worship of emperumAn and SrI purusha sUktham which speaks about his nithya vibhUthi and leelA vibhUthi. 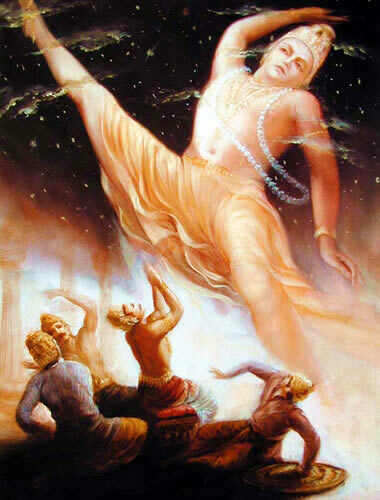 dhEvargaL mA munivar iRainja ninRa – emperumAn standing as the refuge, after divinely measuring the world, to be worshipped by dhEvas (celestial beings) and sages like sanaka et al as said in SrIvishNu dharmam “sankaissurANAm” (When thrivikram measured the world with his foot, he was worshipped by dhEvas, humans and other celestial beings). sEvadi – as said in thiruvAsiriyam 5 “mA mudhal adip pOdhu onRu kavizhththalarththi” (a great lotus flower, placed in an upside-down posture), when the divine foot appears like a flower on the head, AzhwAr lifts his head and sees the enjoyable reddish colour of the foot. It is the rAgam (redness indicates attachment) in the beginning/feet which changed parAnkuSa nAyaki to be in her current situation. Alternatively – it is explained as feet with sevvai (Arjava – honesty). Honesty for the foot is being neutral towards devotees and others and touching all as said in mUnRAm thirvanthAdhi 88 “podhu ninRa ponnam kazhal” (the attractive, beautiful divine feet which are common for everyone). The Arjavam (honesty) of his divine feet makes everyone engage in them as said in thirunedunthANdagam 1 “thaLir puraiyum thiruvadi en thalai mElavE” (His blossoming divine feet are on my head). sEvadi mElaNi sem pon thuzhAy – She was calling out for the gold-like attractive thiruththuzhAy (thuLasi) on such divine feet. enRE kUvumAl – Even if she was given the garland which he wore on his shoulders, she would not accept. Al – exclamation, additional word for poetic sound. kOL vinaiyAttiyEn – I who have sins which will finish me surely. Alternatively – kOl – strong. Sins which can only be exhausted by experiencing the results [of such strong] sins. kOdhaiyE – [kOdhai means flower garland, lock [hair] and a girl who is wearing garland] Four explanations – 1) She, who will torment those who see her garland and lock, is herself being tormented now! 2) She who is having such lock is desiring for another garland [that is worn by emperumAn]. 3) She herself, being a garland on [emperumAn’s] chest, is desiring for another garland! 4) emperumAn is crazy about the garland on his chest and she is crazy on such emperumAn. This entry was posted in thiruvAimozhi, thiruvAimozhi 4th centum on December 2, 2016 by Sarathy Thothathri.